A Japanese pop singer who was arrested for public indecency after being found drunk and naked in a Tokyo park has apologised for his "shameful" conduct. 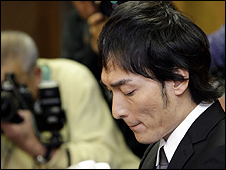 "I drank a lot and did not know what I was doing," Tsuyoshi Kusanagi said on Friday after being released by police. "I deeply apologise to fans for causing so much trouble and worry," he added. Kusanagi, 34, shot to fame as a member of 1980s boy band SMAP. He has not been charged for the incident, which took place in the early hours of Thursday. At the time of his arrest, Kusanagi was allegedly sitting on the grass, undressed and heavily intoxicated. Local media reports said he had drunk more than 10 glasses of Japanese rice wine and beer before going to the park. His arrest has been a major news story in Japan, where Kusanagi is the face of a government campaign to get the public to switch to digital television. Since the arrest, Toyota Motor Corp and other leading companies have cancelled commercials featuring the star.